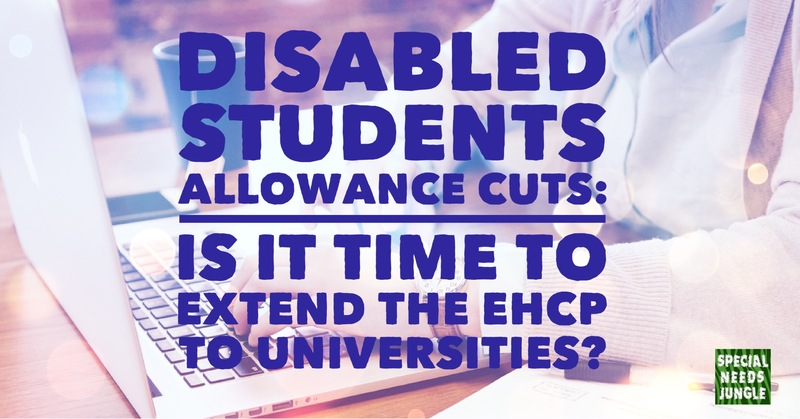 Home Disability Disability Financial Help Disabled Students Allowance cuts: Is it time to extend the EHCP to universities? What do you call it when someone says one thing but their actions show they really mean something quite different? There's a few words and none of them are very nice. Neither is what's happened to the Disabled Students Allowance. You may remember that we wrote some time ago about the threat to the DSA. The government had come out with plans to 'update' the DSA because it said that technology had moved on and so ... blah blah blah... who cares really what their stated rationale was? They thought it was costing too much - that was the bottom line. So, not long before the last election the coalition government said that it was now time for universities to take responsibility for providing these essentials instead of the government. For those with younger children, the DSA is a non-means tested allowance that is designed to help disabled higher education students to attend and succeed at degree and post-graduate level studies. This includes equipment, personal assistants, additional travel needs and anything they may need to help level the playing field. The cuts transfer of responsibilities would mean that funding for assistive technology, such as laptops with specialist software and digital voice recorders would be delegated to universities. However, the then government underestimated the strength of feeling that changing the DSA - and without any consultation or discussion- would evoke. Students, their union, the NUS, along with disabled people's charities/support groups demonstrated against the proposals and they were quietly shelved for a year, perhaps also because they didn't want the shadow of this hanging over them during an election campaign. But perhaps that's just me being cynical? A year later, having realised they couldn't just slip the changes through under the radar, the new Conservative government launched a consultation. Last week, the universities minister, Jo Johnson, announced the results of this. From what it looks like, the consultation was merely window-dressing because the plans seem to have changed little, if at all. Not unlike the way the new Green Paper on higher education funding completely disregarded the views of 95% of respondents to the consultation that preceded it. I mean, really, why bother? Why not just be honest and say, we don't care what you think, we're going to do what we want, because we can. From Mr Johnston's statement, it does seem that austerity is at the root of these proposals and it's targetted yet again at those who need the most support. He cited how technology has moved on but the DSA criteria has not. However, in quoting the increased cost of DSA because of the rising number of students attending university, it's clear what was at the front of the government's minds. I am determined to ensure that disabled students should be able to make use of and develop their talents through higher education and that there should be no cap on their aspirations. Ensuring that disabled people can access higher education is an important part of cutting the disability employment gap. I am extremely pleased that we have seen a rise in disabled students accessing higher education. In 2012/13 DSAs provided £145.8 million of additional support for 64,500 disabled higher education students, compared with £101.3 million awarded to 47,400 students in 2009/10, a rise of around 44%. The Government’s intention is that DSAs will remain available to support those disabled students who require additional help, but should complement the support put in place by HE providers to help all disabled students. Some reforms have already been implemented, with changes made to the funding of computer equipment from the academic year 2015/16. How can he seriously claim to be, "...determined to ensure that disabled students should be able to make use of and develop their talents through higher education and that there should be no cap on their aspirations," and yet whip away the very support they rely on? Forked tongue or what? Mr Johnson is saying universities should fill those gaps that the DSA cuts will leave because the Equalities Act means it's the duty of HE establishments to do so and not the government's. But to students, it feels like the rug is being pulled out from underneath them. The reason for the rising number of HE students with disabilities is most probably because the DSA has meant it has been feasible to take up a place and the internet has meant it's easier to find out information about how to do that. But disabled groups are concerned that many universities that will not provide good enough services and help to cover the DSA shortfall, and this will mean there is much less choice for disabled students. After all, it's one thing to 'meet a statutory duty' i.e. The Equalities Act, and another to provide sufficiently flexible and personalised support such as is possible with the DSA. This is especially the case when it comes to employing personal assistants that some students need to enable them to attend university in the first place. These changes are likely to deter some from applying because once again the barriers may become too high. When we covered this last year, a Diability Adviser contact in who works in higher education told me of her concerns saying that, "The quality of the support that will be available will be completely dependent on the priorities and resources that will be given within an institution [i.e the uni you choose] to disabled students, so parents and applicants will need to check carefully what support institutions are giving. Obviously there has always been an element of that, but DSA at least provided a safety net as the assessment of needs for the student was exactly that - rather than an assessment of what support the individual institution was prepared to give." When I contacted her after the consultation outcome, she said, "I don’t think anyone had any faith in the government carrying out the consultation and they are progressing as they said they would. Student Finance England are noticeably taking a much harder line already on requests. I do think it is time that the Higher Education Institution, HEI, looks at their provision for disabled students, but what students receive will depend on the resources available and attitudes of management to that. I foresee it can only have a negative impact on widening participation, successful graduation and career achievement. University can be hard enough as it is, and if a disabled student is not provided with the support they need to ensure they have the equality of opportunity the legislation states, we are setting up a generation of students to fail. That is surely poor economics…"
Last year Son1 and I visited some universities as he is planning to apply for degree in Musical Theatre. As you would expect, I made a beeline for the Learning Support stands at the uni Open Days (or at least made Son1 push me there in my wheelchair). I was pleased to see how well the ones we visited did cater for young people with disabilities and how well informed about the SEND changes they were. However, they were all concerned about the cuts in DSA because of the personalised support it affords. Higher education was specifically excluded from the new Education, Health and Care plans on the grounds that students had the Disabled Students Allowance. However my argument was always that DSA and any university support were not statutory (above the requirements of the Equalities Act) and so if a university isn't especially hot on support, an EHCP would mean that they had a legal duty to provide what a student needed. Now though, many students will not even have that safety net and this could mean the difference between the successful completion of a degree and dropping out. When we visited those universities, they were all very keen to make use of my son's EHCP as a good guide to the support he needs. But these were all well-respected highly-ranked universities. The latest Equality Impact Analysis on the effects of these cuts was published this month by the Department for Business and Skills. It pointed out how that there was a risk disabled students will be adversely affected by these changes but the government went ahead and made them anyway. My proposal is that if there is no chance of the EHCP protections being extended to cover higher education, then why not extend the SEND Code of Practice so it applies to universities as 'non-statutory advice'? This would be the same way that many education policies apply as 'non-statutory advice' rather than a statutory duty to independent schools. While it wouldn't lead to funding in an explicit way, it would at least mean that HE establishments should take note of an EHCP so that any gaps left by DSA cuts can be noted and hopefully, provided for. After all the EHCP may well only be 18 months or two years old. So that you have as much information as possible if you are planning to apply for DSA, we've outlined the changes, as stated, below. In his statement, Jo Johnston said that more talks will be held to determine if exceptions to the general rules for non-medical help (NMH) should be considered. DSAs will retain primary responsibility for funding Sighted Guides, for those students that need such support to enable them to get around campus effectively. HE providers will be expected to take primary responsibility for the remainder of the non-medical support roles that are classified as bands 1 or 2 in the Student Loans Company non-medical help (NMH) manual. We will seek further information from stakeholders, including from disabled students and their representatives, on whether specific exceptions to this general rule should apply. In addition, HE providers are expected to consider how they deliver information to students and whether strategies can be put in place to reduce the need for support workers and encourage greater independence and autonomy for their disabled students. DSAs will retain primary responsibility for funding the most specialist non-medical help support, that are set out in the SLC NMH manual under bands 3 and 4, with the exception of Specialist Transcription Services. HE providers will be expected to take primary responsibility for the provision of Specialist Transcription Services, other than by exception. DSAs will meet the additional costs of accommodation where that accommodation is not provided by the HE provider or its agent. DSAs funding will not be available where specialist accommodation is provided by the HE provider or their agent, other than by exception. HE providers should no longer pass any additional costs for accommodation onto the student. Devices for printing and scanning will continue to be funded through DSAs. However, HE providers are expected to strive to meet the needs of their disabled students to reduce the need for the purchase of individual devices for printing and scanning. The assessment process will be more robust and individual devices will only be funded if the need cannot be met through other measures. In parallel a new quality assurance framework will be put in place to ensure financial and quality assurance of the provision of non-medical help. The Minister for Disabled People and I expect all disabled students to have access to good quality support and that public funding is managed effectively in the delivery of that support. Changes to the way equipment will be purchased in the future are also being explored, to ensure value for money is achieved in this area. The changes in this Statement will apply to all full-time, full-time distance learning, part-time and postgraduate students applying for DSAs for the first time in respect of an academic year beginning on or after 1 September 2016. Existing DSAs students and DSAs students for 2015/16 will remain on their existing system of support for 2016/17. To me, the most shocking element is the lack of any meaningful action on means of redress. If a university can’t or won’t make reasonable adjustments, there is very little that the disabled student can do about it – and the Government knows this. My understanding is that there is no body with the power to direct a university to make a reasonable adjustment if it was found to be acting unlawfully. For the Government to go ahead with these cuts, with a vague promise to review the exceptional case process, is, to me, just reckless and cavalier. The SEN and Disability Tribunal can already consider cases around disability discrimination in schools, as well as issues around EHCPs. I’d like to see the role of the Tribunal extended so that it can look at cases around discrimination in universities. Thanks for your comment, Ian. I think that’s a good idea. I passed on my views about this universities and EHCPs in the wake of these cuts to the SEND Minister, Ed Timpson when I met him yesterday with a group of other parents. I’m not confident anything will happen but perhaps it’s time for a campaign, depending on the support out there for it. I’m writing a research paper on this very topic. I’ll share my findings once complete. Excellent, Margeurite, we’ll all look forward to it! IMO all advice should be statutory. We are bruised by our 18 year old daughter’s awful experiences with a school judged outstanding and a LA that openly lies through its teeth – they have been nothing short of abusive working practices directed towards a vulnerable young person. We looked at an OU degree last year as a means of bypassing the need to get level 3 qualifications and we went through the DSA assessment process last year – far more professional, detailed and objective than anything the LA has ever done. The idea didn’t work out because online collaboration and contibutions to social media were an assessed part of the course (not possible because of the individual impact of my daughter’s ASD). For the same reason assistive techology such as brain in hand is of no use. EHCP’s should apply in higher education but IMO they should be conducted not by the LA but by independent assessors. The whole system is a complete mess and it will not improve and ensure young people can access higher education if DSA is cut/withdrawn. Nobody really cares. Thanks for your comment, Carrie. Yes it seems there is a long way to go at this level. Young people don’t suddenly recover from their SEND once they reach 18 and while it is good that an EHCP can go up to 25, the exclusion of universities is counterintuitive. If a young person with disabilities has strived to reach uni level, then they should be able to expect suitable support that enabled them to get there, to continue. And the lack of redress means that there is no incentive for authorities to fulfil any duties on them. Support post 16 needs to be re-looked at to cover all eventualities and destinations to ensure that our young adults can succeed in higher studies and employment, as they deserve to. I hope your daughter finds success soon.